I'm also instituting an acceptance form I talked about a long time ago but never actually made up, so, if I'm interested in the manuscript, I just have to fill in the writer's name, the title, and what I would like him or her to respond with: five chapters, the full ms., patience (i.e., the further review), or a revision based upon comments I write on the letter. This form has already proved MUCH faster than the old method of typing up a complete letter for the writer, filling in the name, address, and title, printing it out on letterhead, etc., so I'm hopeful it will continue to increase my efficiency and decrease my response time in the future. Finally, there was not a single ". . . Or did she?" query letter in the bunch. Thanks for paying attention! You've got to see this awesome video of a crazy fish called the barreleye. It has a transparent head! And tubular eyes that can look forward or rotate up so it can look through its aforementioned transparent head! It is incredibly, delightfully strange. I was much struck by this question for readers on Jennifer Crusie's blog: "On what do your base your expectations of what a book will be like?" Author, flap copy, cover, etc.? I'm working on my talks for the Missouri SCBWI retreat right now (as well as going through SQUIDs), and one of the things I'm thinking a lot about is how writers set up the reader's expectations for the book in the first chapter, and how that shapes everything that comes after. . . . If you have anything to add to the discussion, I'd be glad to hear it in the comments. Editor Martha Mihalick has a wonderful blog: A Curiosity Shop. And former Harper executive editor Alix Reid has a great, reflective blog called Delightful My House. I especially liked her post "Is it the editor's fault or the writer's?" ... I consider this question a lot when I read a book that I think could be better (most recently with Twilight), and the answer is usually: The ordinary reader can't know. We can guess, comparing it to other books the author has written or the editor has edited (if you go that inside-baseball), but even then only the editor, author, and maybe the agent know what happened on the page. I'm just grateful for the times this question doesn't come up. Our church book sale raised over $15,000 -- thanks to any and all of you who came out and bought books! The lovely Marcelo in the Real World has accumulated five starred reviews! And Lisa Yee had a terrific Q&A in a recent issue of the PW Children's Newsletter. And this being Park Slope, we have a ton of kids and young-adult books, alongside lots of nonfiction and esoterica. I almost bought a Victorian-era hardback of Anna Leonowens's memoirs, complete with gilt detailing on the hardcover and engraved plates throughout; but passed because bookshelf space here is at such a premium already. . . . I don't know that I can afford to keep books I won't read just because they're beautiful. That may have been a stupid decision -- but if it was, you can profit from my stupidity by purchasing it yourself! PSUMC is located at the corner of 6th Ave. and 8th St. in Park Slope; take the F to 7th Ave. or the R to 4th Ave./9th St. Donations are also welcome from 10 a.m. to 9 p.m. on Friday, at which point we become an all-retail enterprise, one well worth your time. Hope to see you there! "Coffeehouse" (the noun) is one word, not two. "Forebear" is strictly a noun used to refer to one's forefathers and foremothers; "forbear" is the verb for "to restrain oneself from doing something" (though it can also be an alternate spelling for "forebear"). A sepoy is a native of India in the military service of a European power (most frequently the British). Hatton Garden ("Garden" definitely singular) is the jewelry district of London. The word "moil" means "to work hard; drudge" or "to whirl or churn ceaselessly." The word "execration" can mean the act of cursing, the curse itself, or an object of a curse. Quite a few interesting facts about Zoroastrianism. Laini Taylor writes like a goddess, and her collection of three novellas about kisses, Lips Touch: Three Times, coming out from us in the fall, is as delicious as Daniel Craig holding a Jacques Torres chocolate bar. This month's SCBWI-Tokyo newsletter (PDF) carries a very nice interview with me all about Moribito, The Snow Day (both books translated from Japanese), and acquiring and editing translations. Thanks to Sako Ikegami for the thoughtful interview questions and putting it all together! More international SCBWI news: I'll be appearing at SCBWI-Paris on Saturday, May 2, to give a craft talk (not sure on what subject yet). This will be near the conclusion of a Barcelona + Paris jaunt my sister and I have been planning for months now; if you know of any off-the-beaten-path places in or near those cities that we should especially check out, do say the word. The radio silence for the last week will probably be the norm here for the next couple of months as I burrow on through all I have to do. Thanks for your patience and sticking around. And What Does the Swedish Chef Say When He's Stressed? Which is me also these days. Two novels still being line-edited that are due to copyediting by the end of March; four conference presentations to write; twenty critiques to prep; one article to finish; and that's on top of the daily responsibilities of my job and the other mss. waiting their turns for editing or reading. The good news is that I have a decent first draft of the article done, and a fairly organized plan of attack for everything else in my mind, but if you don't get an e-mail back from me or something, it's really, really, really not personal. The also good news is that I love the work, especially the line-editing. When I told one of the authors whose novels are on my desk "This is the fun part," she gave me an extremely dubious look, which I understand; but this really is the most fun part of the editorial process for me: looking at how all those words become sentences and sentences become paragraphs and paragraphs become scenes and do-we-need-this? and but-on-page-87 and what-about-. . . and love-this, over and over, till all those things work together to take on their sharpest, clearest, richest meaning -- or they will once the author responds. It is like I am having a very intense conversation with both the manuscript and the author through the manuscript, and as I adore both author and manuscript, it's almost like an affair. (Or what I imagine a really good affair is like.) "Mechanic's delight," as Brian Doyle said. I don't get a charge out of writing, really -- I like blogging, sharing neat things and odd thoughts with the aether, but fiction-writing is far more curiosity than compulsion for me. But I get my PaperMate mechanical pencil in hand, an eraser and 1.5" Post-Its by my side, and a good ms. on my clipboard, and I am a happy girl. Clearly all this work is addling my brain. Or else I've got a strange disorder in which line-editing causes dopamine surges or somesuch. Nonetheless -- back to it. To celebrate, please leave a compliment on the website of your favorite blogger. (And I really sincerely don't mean this to mean me -- much more fun to have my blogiversary celebrated throughout the Internet, I think.) Happy my-blogiversary to you! 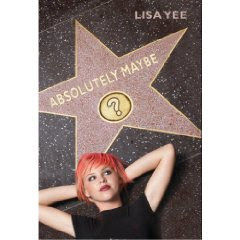 Lisa: ABSOLUTELY MAYBE came out of nowhere. Well, not exactly nowhere, but it did take me by surprise. Originally titled CHARM SCHOOL DROPOUT, the novel was supposed to be a humorous middle-grade story about a goth girl whose ex-beauty-queen mother ran a school for beauty pageant contestants in Florida. Maybelline (named after her mother's favorite mascara) was slated for a major makeover by her mother to get her pageant-worthy. As I began writing, I discovered that Maybe was more cynical and sensitive than I had imagined. And her home life was awful. So I upped her age from twelve or thirteen years old to sixteen years old when the book begins. By making her older, it gave me more latitude with the story, like having her run away to Hollywood with her two best friends. It went from a frothy story to one with more depth as Maybe struggled to come to terms with her alcoholic mother and herself. I had no idea I had written a young adult novel until my agent, Jodi Reamer, read the story. She called me and said, "I love this, but it isn't what Arthur and Cheryl are expecting. You need to tell them it's a YA before they read it." Then I got scared, because I wasn't sure if I'd breached my contract by writing something wholly different than what we had decided on. So, I told my editors to prepare themselves for a novel for an older audience, sent in the manuscript and held my breath. Cheryl: Arthur and I have been working with Lisa for five books now, and even if we know more or less beforehand what voice she's tackling or where the plot is headed, it's always exciting to get a new manuscript from her. So the news that CHARM SCHOOL DROPOUT had become a YA novel made us doubly excited and curious -- not just "Yay, a new novel from Lisa!" but "Wow, Lisa's doing a YA! What's that going to be like?" Well, the answer was wonderfully fresh and character-driven as always. It was the character of Maybe that set this story in motion -- both literally and literarily. But the supporting characters were just as clear and real and full of life: Ted, her hilariously honest best friend; Hollywood, the aspiring filmmaker who crushes on Maybe and takes both her and Ted to California to look for Maybe's dad; and looming over the entire journey, Chessamay Chestnut Abajian Wing Marshall Wing Sinclair Alvarez and soon-to-be Himmler, Maybe's alcoholic, ex-Miss-Florida mom. So what is the change that Maybe needs to make in the course of the book—not in relation to her dad or Chessy, but within herself? Who does she want to be, and how can we see her evolve into that? . . . What we suggest is that you look back over the course of the book and see if there are places throughout where Maybe could take more action . . . Could you show us something in Maybe’s choices that might lead to [a certain event] instead? We sent this letter back to Lisa, and, after she'd had time to digest it, we talked on the phone to be sure Lisa was comfortable with everything in the letter and we all knew where things were headed. Then it was her turn to respond . . . Rumor has it that Amazon.com is going to announce the Kindle 2.0 shortly, and for those of you who have been curious about this device, here are some quick notes on my experience with it. I love my Kindle for one simple reason: All my manuscript reading fits into my purse! Last week I took multiple trips to Midtown to see a friend (about 45 minutes from Brooklyn each way), and I got a good half of a manuscript read in that time without having to juggle a huge mound of loose paper. And most agents now submit manuscripts electronically, so it works out very well. I don't plan to use it for general slush (that is, SQUIDs), but if I request a full manuscript from an unagented writer, I will probably ask that he or she e-mail it to me. I wanted a Kindle rather than a Sony Reader because (a) it has a keyboard and (b) it has a wireless connection. With (a), I can do text searches through the various manuscripts I'm reading, or make notes within those manuscripts (though the keyboard isn't the fastest or most comfortable keyboard to use -- my note-making is limited, though I like the search option). With (b), I get the New York Times delivered to my device every day! I can download any book I want from the Kindle Store at any time. And I can download manuscripts to the device, or certain other people (only those registered with my account) can send manuscripts to the device, without my ever touching a computer -- very useful if I'm working at home on a Friday, say, and a colleague wants to send me a manuscript to read over the weekend. To transfer a manuscript to my Kindle (file formats accepted: .doc, .pdf, .jpeg, several others), I e-mail it to one of two special Kindle addresses, depending on how I want it delivered. One address will convert it to the Kindle format and deliver it wirelessly, but charge $.10 to my Amazon account for it; the other will convert it and deliver it to my gmail account for free, and then I can download it to my desktop and transfer it manually using a USB cord. The latter process is kind of cumbersome, so I try to do a bunch of USB downloads all at once, but for individual manuscripts, sometimes the wireless option is just TOO easy and seductive . . . I can make the font size bigger or smaller, which is very useful. It is EXTREMELY easy to read the screen -- just like reading the printed page, with none of the vibration of long hours spent reading a computer screen. It's also extremely easy to turn a page accidentally, thanks to the huge "Next page" button on the right; and, when I'm holding it by the spine in its book cover, it's hard to hit the "Prev Page" button when necessary. I hope also that the 2.0 version will have some indicator that correlates the location marker in the digital version with the page number of the printed page. But those are small complaints. I bought a cookbook from the Kindle Store, and while the Kindle is not very good for navigating a big browsey book of that kind, I love the fact that I can look up a recipe on my subway ride home, stop by the store and do all my shopping, then head home and cook without ever touching a piece of paper. I've found I don't like reading the Kindle in bed at night, that it doesn't deliver the same relaxing experience of a physical book . . . probably because of the inherently electronic nature of the device, the fact that one side is thicker than the other (so it feels imbalanced when you hold it between two hands), and the fact that it's associated so strongly with work for me. And there are some literary experiences I still want to have on paper -- I tried a sample of Marilynne Robinson's Home, for instance, and I think I'm going to hold out for getting the book. But for things like the Times or manuscripts, which I'd just be reading on flimsy paper anyway, I'm delighted to have the Kindle.